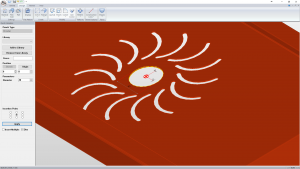 Design is an add-on to the BendSim or Unfold packages and is used design of basic 3D sheet metal models and pipe sections. It is possible to take production aspects, such as tooling and material, in account while designing the model. Flat pattern is available without any further processing, just click a button. 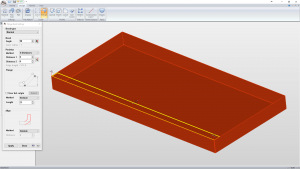 It is the simple 3D CAD tool to get started in the cases where no 3D model exists. 3D model is a virtual prototype. Using 3D models is the way of the future. 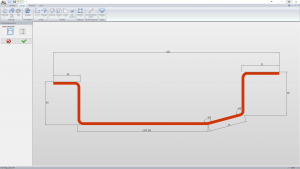 You get an accurate view of what your product will look like and the production data will based on the finished dimensions, not the other way around as it is with use of 2D data. The fact that Design add-on is parametric means that you can change all of your design and dimensions at any time instead of redrawing. It is actually possible to work in both the 3D model and in the flat pattern simply by toggling with a button. Getting the blank size can not be easier. Adapt your design for production. Already at the design stage you can base your part on criteras set by the work shop. For example you can base your model on material and tool selection. Simple and quick to learn. Design is a basic 3D modeler for sheet metal parts, and sheet metal parts only. It is not a full scale 3D CAD system, and is not intended to be. Due to that, the learning time is relatively short. Pipes, as easy as it gets. Design contains the most common pipe models needed for this type of work. Many variants of the same basic shape can be created, eliminating the need to have hundreds of model to choose from. Below you will find a short description of the main technical features of the Design add-on. …means that dimensions and features can be changed at any time during the design process. This is a huge advantage that saves a lot of time and excellent when doing variant designs. …ensure that you will get accurate results when producing your part. This is achieved through selection of material and press brake tooling, which are the factors that affects the blank size. …are necessary to be able to create all the different types of elements in sheet metal parts. With Designer you have most of the ones required, such as Sketch, Flange, Punch, Cut-out, Fillet, Chamfer, Patterns, Join Corner etc etc. These tools can be combined in indefinate ways to get the part you want. …are extremely helpful when designing your part. They allow you to see what the result of your values/parameters will be, even before the feature has been applied to the part. This takes a lot of guessing away and that saves a lot of design time.